What a chilling 911 call. Hopefully the police will find the person responsible for causing the explosion. A 911 caller warned of further explosions right after the blast that rocked Manhattan’s Chelsea neighborhood and injured 29 people, The Post has learned. “I’m looking at the explosion down the block. There will be more,” the unidentified male said, claiming to be standing at 23rd Street and Seventh Avenue in the aftermath of the terrifying incident, according to law-enforcement sources Sunday. 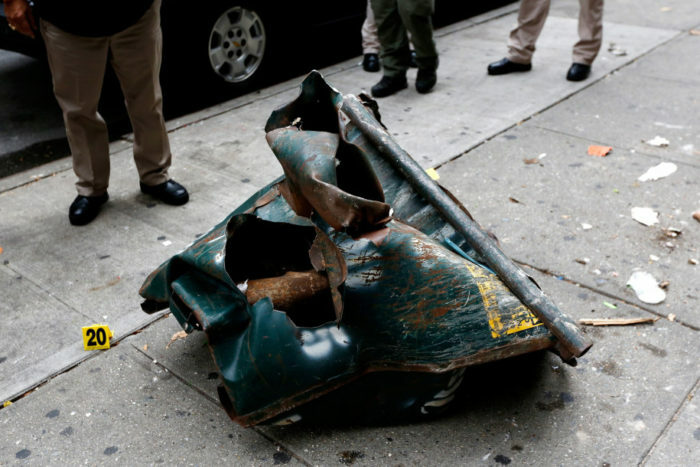 Investigators believe the blast was the result of a home-made, pressure-cooker bomb similar to an unexploded device found later on 27th Street, sources said. The men called 911 around 11 a.m. Sunday to report what they had seen and were brought to Manhattan for questioning, sources said. Investigators have obtained surveillance video of a person placing the unexploded device, sources said. It was found by an older woman who was phoned by a friend checking on her in the wake of the explosion, sources said. The woman went outside her home and noticed the bomb, then called 911. State police secured the device, and it was taken to the NYPD firing range at Rodman’s Neck for investigation, sources said. Initial analysis of the garbage Dumpster that was ripped apart in the blast suggests whatever blew up was placed outside the bin, sources said. The blast pattern shows the metal is bent inward, and an explosion inside the Dumpster would have bent the metal outward, sources said.